Lovelace was once merely a ship's artificial intelligence. When she wakes up in an new body, following a total system shut-down and reboot, she has no memory of what came before. As Lovelace learns to negotiate the universe and discover who she is, she makes friends with Pepper, an excitable engineer, who's determined to help her learn and grow. Check out my review of The Long Way to a Small, Angry Planet here! Considering The Long Way to a Small, Angry Planet is one of my favourite books of all time, I'm a little ashamed it's taken me quite this long to get to A Closed and Common Orbit. If you haven't read The Long Way to a Small, Angry Planet yet and you're planning to, I advise you to stop reading this review now! I try to keep my reviews spoiler-free, but I don't think you should go near A Closed and Common Orbit at all if you've yet to read the first book. It was lovely to be back in this world, in this universe I fell in love with in the first book, and stepping back into it felt like stepping into a place that restores my faith in humanity. Unfortunately I didn't love this one as much as I loved the first one, but I also wasn't expecting to; The Long Way to a Small, Angry Planet is one of those rare books that's simply perfect. 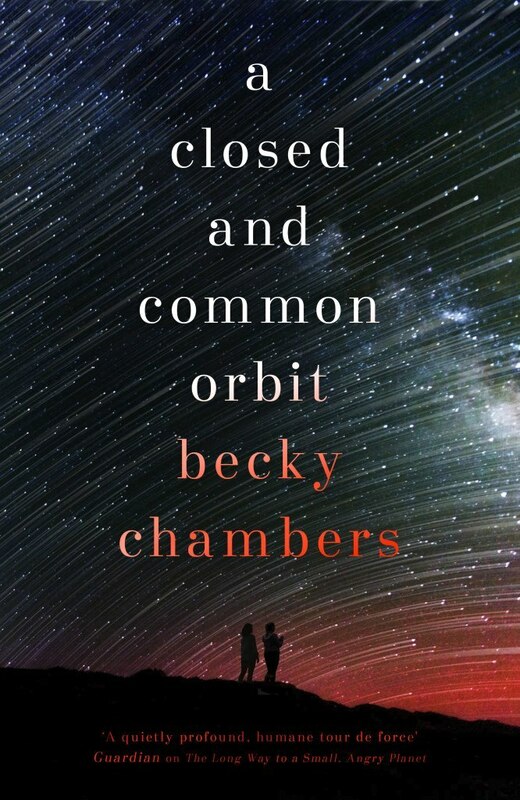 When I read the blurb for A Closed and Common Orbit I predicted that I'd find Lovelace's story much more interesting than Pepper's, but it actually turned out to be the other way around. That's not to say that I didn't find Lovelace's chapters interesting because I really did; as I expected, Chambers' exploration of AIs was fantastic throughout the novel, but while I enjoyed those particular parts of Lovelace's chapters and completely empathised with her frustration at being trapped in a body she felt she wasn't suited for, Lovelace just didn't grow on me in the same way that Pepper did. I'm not sure I can accurately pinpoint what it was about Pepper that made me so fond of her. We discover how much crap the poor woman went through as a child, so I found something really rewarding in watching her overcome all that hardship with the help of a woman called Owl who may have been my favourite character in the book. The relationship between the two of them was heart-warming, and while it became just the slightest bit saccharine near the end of the novel I didn't mind; I needed to read something nice, something hopeful, and though this book isn't hopeful in the same way The Long Way to a Small, Angry Planet is, it's still lovely. It would be unfair to compare another book, even a book set in the same universe, with A Closed and Common Orbit. The two books are such different stories - A Closed and Common Orbit is a much more confined, secretive story, as the title suggests - that it's impossible to truly compare them. Chambers excels at quiet, kind science fiction, and I enjoyed learning more about AIs and Aeluons in this book. I can't wait to return to this universe for a third time, and will happily gobble up whatever Chambers writes.